We are about to release a great addon for JDeveloper that can access a SOAP web service. For demonstration purposes we want to have a publicly available web service that anyone can use. Having this web service hosted on Google App Engine has two major benefits: it is free and is accessible for anyone on the internet 24x7. You can use the normal JAX-WS annotations in your service class and use JAXB to marshal and unmarshal the request and responses. This is all very similar to a JAX-WS service on a JEE container. The thing you need extra is a custom HttpServlet that handles the HTTP POST, unmarshals the request payload to a java object using JAXB, invoke the actual web service class, marshal the web service class response back to XML and send it to the client. 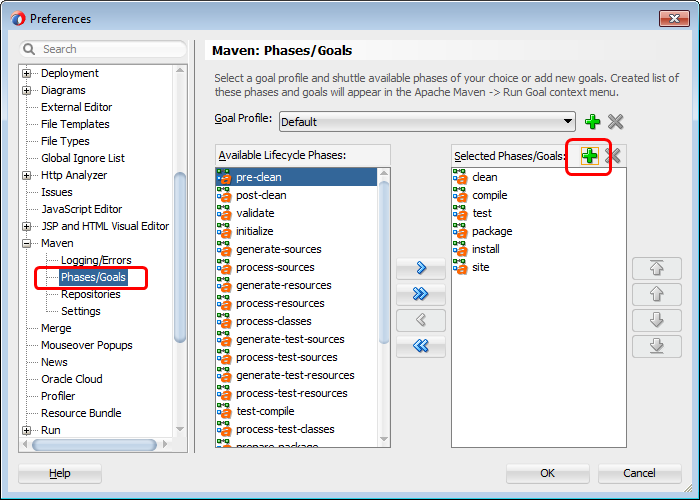 This post describes all the steps to create a project using maven and complete it in JDeveloper 12c as well as deploying it to a local and remote server. If you prefer other build tools, like Apache ANT, or other Java IDE's you can still use similar steps but you might need to adjust them for your environment. The key part is the custom servlet which is the same for each setup. Next steps are for Oracle JDeveloper, but you can take similar steps from the command line or your favorite Java IDE. 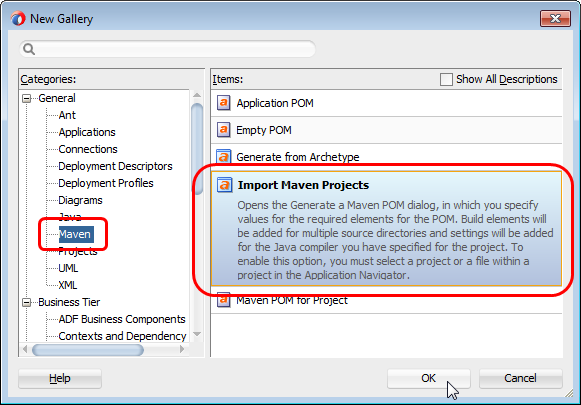 Create a new JDeveloper workspace from the maven pom files. JDeveloper will warn that the project already exists and it will be overwritten. Just click Yes even though this is a new project. Open the pom.xml at application level and update the appengine.target.version property to the latest App Engine version. Currently this is 1.9.2 but you might want to check the latest Java SDK version at https://developers.google.com/appengine/downloads. 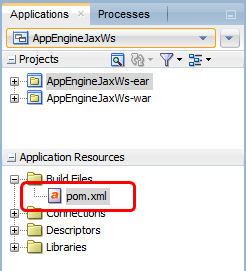 Open the project properties for the AppEngineJaxWs-ear project and add the src/main/application directory to the Java Source Paths. 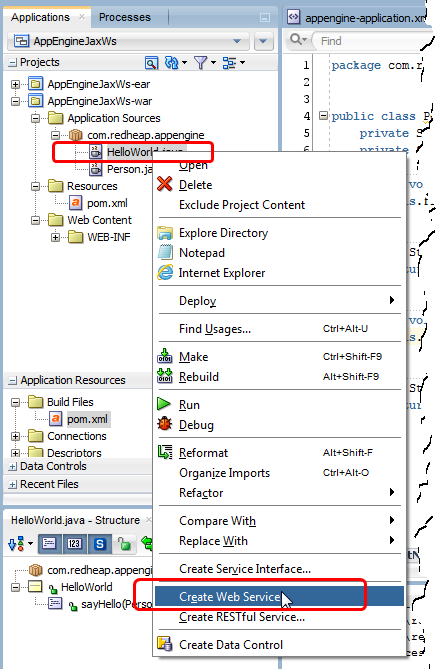 Right click the HelloWorld class in the application navigator and create a web service out of it. When running this for the first time it will ask if you want a WebLogic specific web service or JAX-WS Reference Implementation version. Be sure to check the RI one as we want to deploy to a non-weblogic environment. Other than that, accept all default values. If you are not using JDeveloper, you can also use the command line wsgen tool that ships with the JDK. This will have added a number of annotations to the HelloWorld class. Change the @WebParam annotation for more meaningful argument name than arg0 as this name will end up in the XSD for the web service. Now right click HelloWorld again and generate a WSDL file. 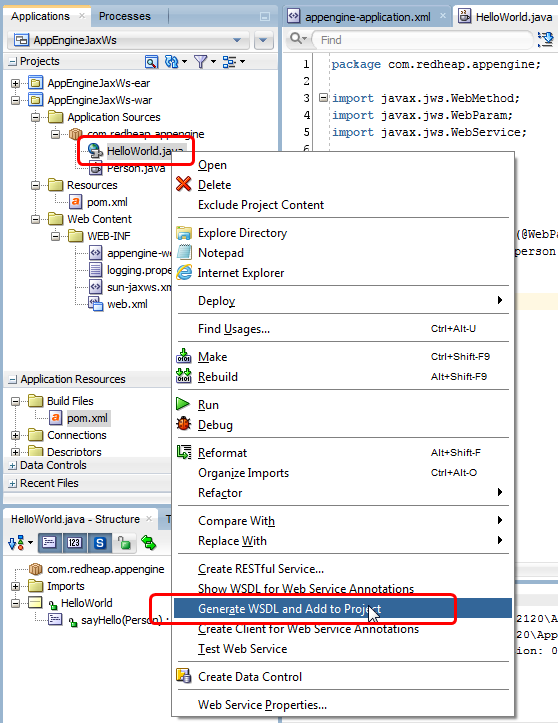 Right click the generated wsdl file and use the Move option from the Refactor menu to relocate it to webapp directory itself (two levels up) so the file is no longer in the WEB-INF folder and accessible through the web. Repeat the same steps for the xsd file so it will also be available on the web. 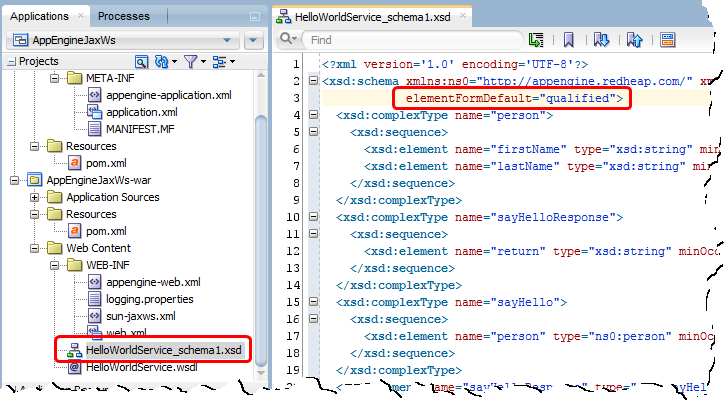 Open the generated XSD file and add elementFormDefault="qualified" to the root element to ensure we will be using namespaces in the web service requests and responses. 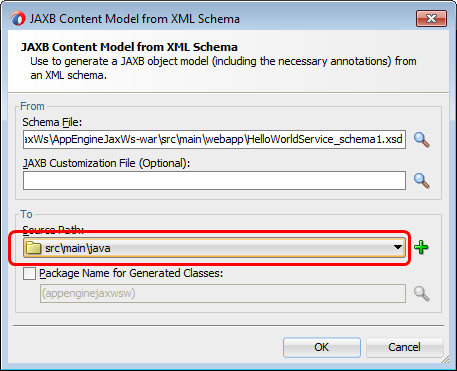 Now right click the XSD file and create a JAXB Content Model. Be sure to select the correct source directory for the JAXB classes in the wizard as you don't want them to end up in your test directory since those are not included in a deployment. Google App Engine doesn't include the com.sun.xml.ws. * classes that are normally used by a JAX-WS service. So we need to create our own servlet that handles the requests and invokes the HelloWorld class. This is where the magic happens. Most of the code in this class is generic for any webservice. We implemented everything in a single class for this example, but in a real application you want to refactor the generic code to a super class that can be reused for each web service. 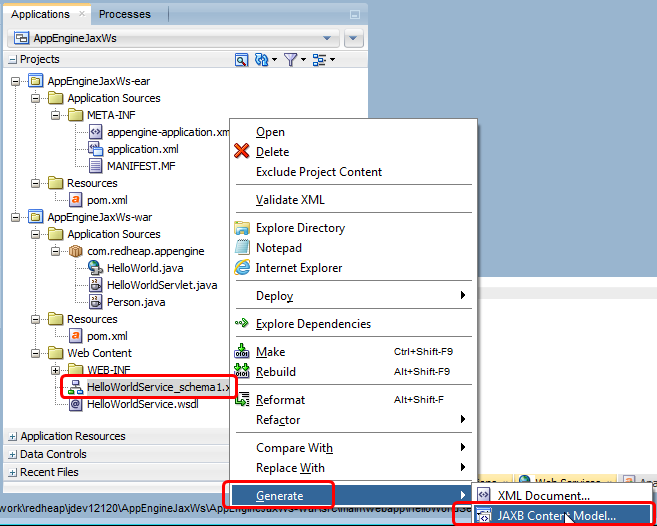 Remove all entries from web.xml that were created by the web service wizard in JDeveloper and register our own servlet. The url-pattern has to match the endpoint you configured in the soap:address in the WSDL file. 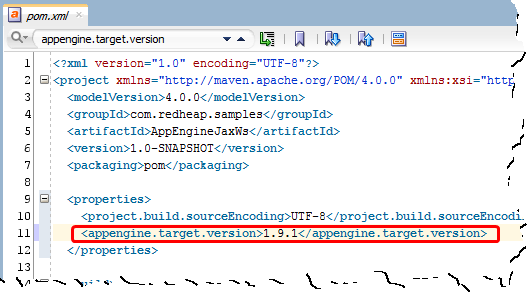 Add two goals: com.google.appengine:appengine-maven-plugin:devserver and com.google.appengine:appengine-maven-plugin:update. The first one is to start a local AppEngine server for testing and the second one is to deploy your application to the real Google App Engine. 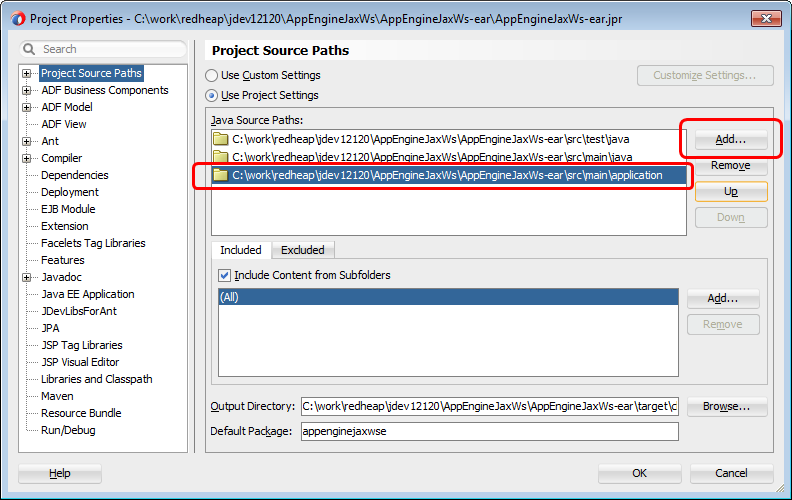 Once this is fine, you can run the appengine:update phase from the AppEngineJaxWs-ear project. This installs the project at your Google AppEngine server. Be sure to run this from the command line the first time and not from JDeveloper. The reason is it will launch a web browser to authenticate yourself and you have to enter a code from the web browser into the maven build. This cannot be done when building from JDeveloper as it doesn't allow you to enter information. You're done. 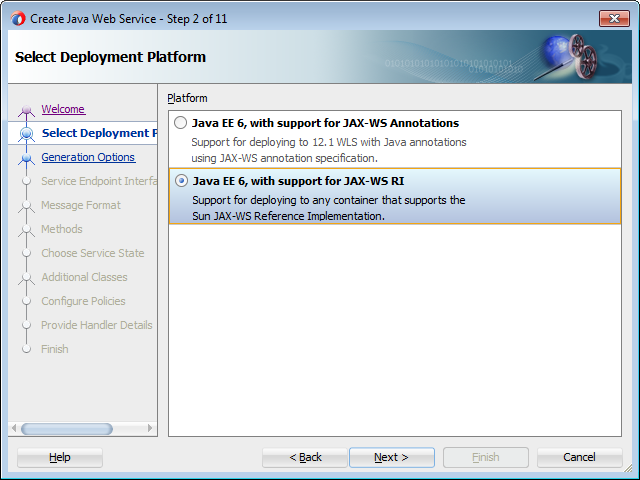 Enjoy your Google AppEngine JAX-WS Soap WebService. You can also give my instance a try. The WSDL is available at https://redheap-jaxws.appspot.com/HelloWorldService.wsdl. 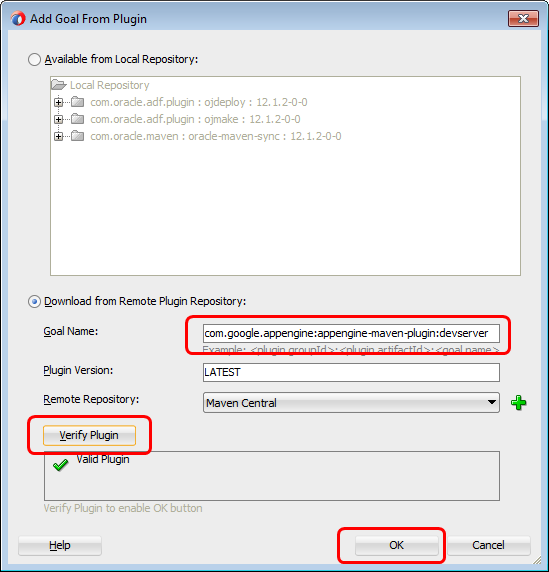 Give it a try in SoapUI. As always you can download the full sample application or browse the subversion repository to look at the source code. If you want to have a quick look at the solution start with the com.redheap.appengine.HelloWorldServlet servlet that does most of the important work. Excelent post Wilfred! thanks for sharing your knowledge!